Newtown, CT October 1, 2010 – Newtown resident, Seth Morris recently won the Connecticut State BMX Championship, placing first in Connecticut for his age and proficiency (15 year-old Novice). The State Championship Race was held at the Trumbull T.R.A.C.K. on September 12th. 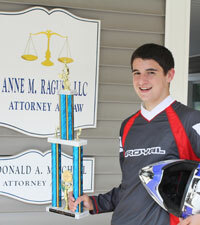 Seth’s proud sponsor is his mother and Newtown attorney, Anne M. Ragusa. In preparation for the race, Seth practices on his home track, the Bethel Supercross in Bethel, Connecticut. When he is not on his bike, Seth attends Immaculate High School in Danbury as a sophomore. supports and promotes the sport of bicycle motocross racing (BMX) and organizes, regulates and sanctions BMX racing competition events throughout the United States. The NBL sanctions community organizations or groups to use BMX Racing as part of their service to their own members, as well as the community at large. Through year-round local, state, regional and national programs, people from all ages and all walks of life are given an opportunity to participate in a world-class, Olympic sport. The NBL is committed to developing not only star BMX athletes, but star people of today and tomorrow. Credit to www.nbl.org.